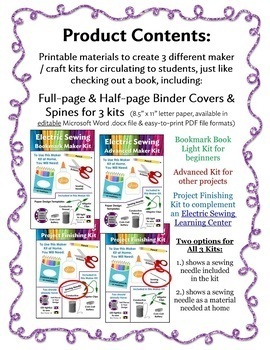 Makerspace Circulating Maker Kits BUNDLE! 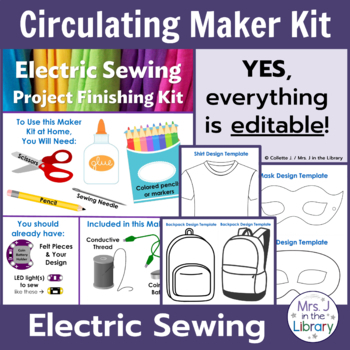 Empower your students to learn to sew and make circuits at home with these electric sewing maker kits! 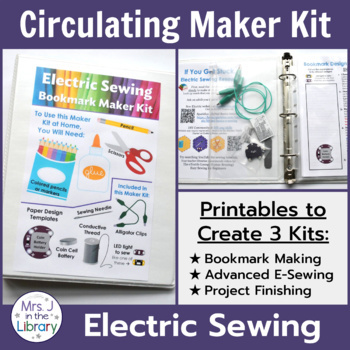 This product includes 51 pages of materials to create 3 different Electric Sewing Maker Kits out of binders or mini binders for students to check out from your library or classroom. It’s a great way to connect home and school learning! ♦ Bookmark design template with images of e-sewing pieces printed at actual size for 3-volt coin cell battery holder and sewable LED lights. 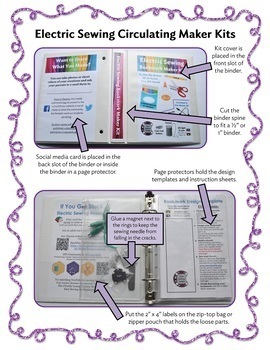 ♦ Students will already have the craft supplies, e-sewing components, and design template from school. Please DOWNLOAD THE PREVIEW to view images of all materials, links to the FREE MARC records for libraries, and instructions for putting together the kits. If you aren’t familiar with the maker movement or makerspaces, I recommend downloading the preview and doing your own research on makerspaces and the Maker Faire. I’ve found the "Makerspace Playbook" by MAKE: magazine to be very helpful.